The other day I was driving West on I-10, my thoughts ranged from the mundane (how was I going to find the time to stain the floors of the Oldcastle house) to the odd (I love renovation. Why didn’t I do this full-time?). I’ve discovered laying glass tile is a breeze. If they weren’t so expensive I would plaster rooms with them. Rooms! At the Oldcastle house I put glass tile around the bath vanity, including at the floor around the vanity because the hole that we filled in with cement was filled too high to put conventional tile on. 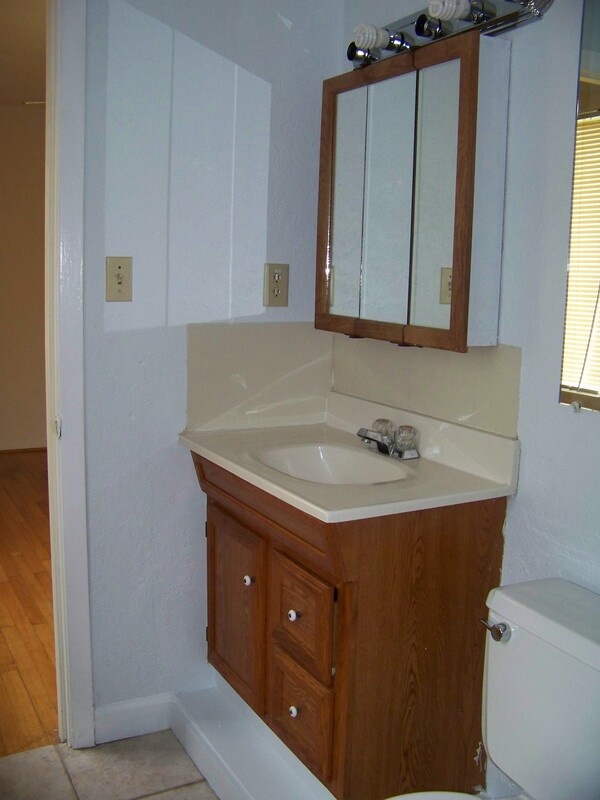 So here you see the dark tile around the new vanity. Sure, I could begin a small renovation business. 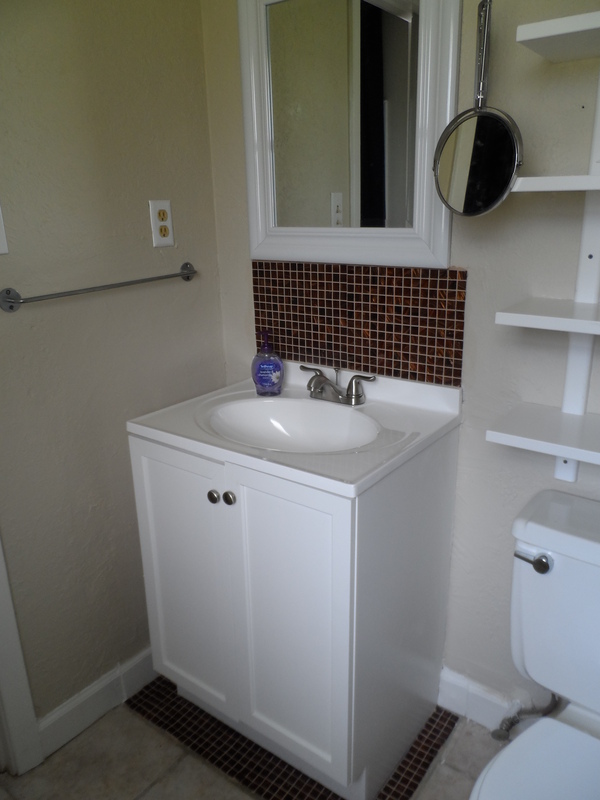 I had just installed glass tiles and grouted them in the master bath of the house. They looked perfect. I had designed several of the new elements of the house from the cabinets (wish they were all white, though) and the bathroom vanities. I had added a light where there was none to create a dining room area. It was fun. Just wish I wasn’t using our money to do it. How much more fun would this be if it were someone else’s money? 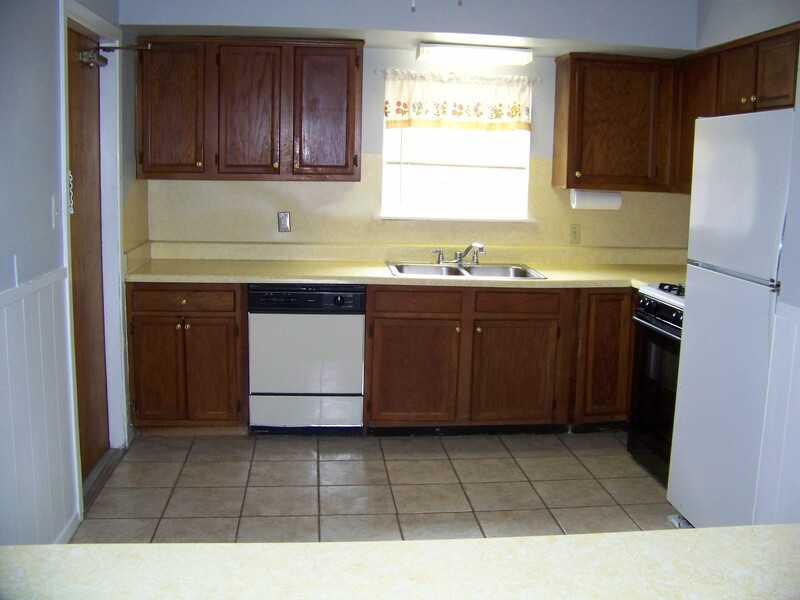 I could do wonders for people looking to change their old and drab bathrooms and kitchens. 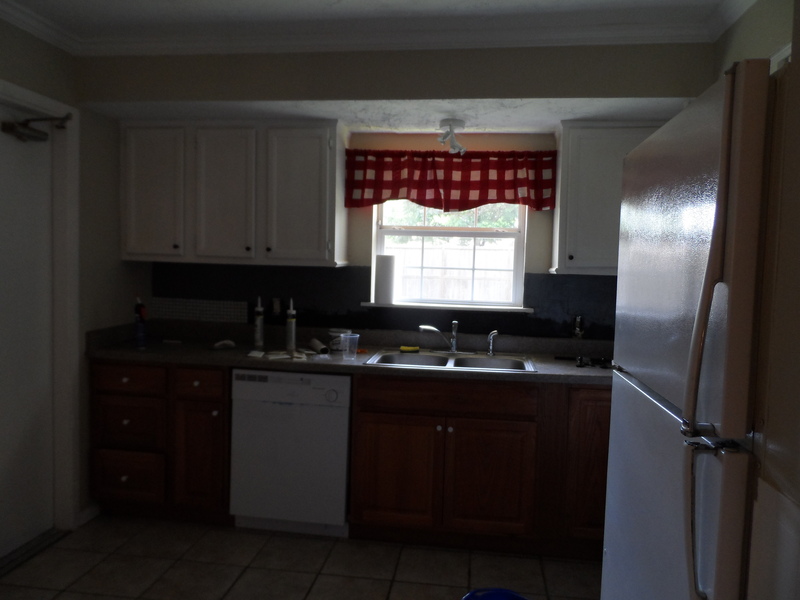 We had already been approached by two neighbors who were interested in purchasing the property. So I knew things were going to be okay with it. We had established that this week we would be putting up a “for sale” sign. Finishing touches, completing the punch list, that’s all we have left. Then my mother-in-law called. She had blood in her stool A lot of blood. She wanted a ride to the doctors. My husband took her, after a consultation with the doctor, they had her at the hospital in fifteen minutes. Her blood-thinner levels in her blood were at the stage where it was surprising that she had survived. She was bleeding internally. There was fluid around her heart. It didn’t look good. First night in the ICU she called my husband at 2 AM and told him if he didn’t get down there and get her out he would find a dead mother in the morning. We spent time with her the next few days. Every day and every night it was a new conspiracy theory. For instance the hospital staff was conspiring against her to keep her in bed so they could take more of her money. And the electronics in the room were making the clocks and her watch jump ahead every few hours so that it always looked like 2 AM so she would remain confused. The scary one was that no one was visiting her. And who was I to tell her different? We wouldn’t take the time to come visit. We weren’t caring enough to make sure she was fine. Okay. My sweet, dear, beloved mother-in-law had gone “around the bend” in a big way. The renovations and the rest of the world had to come to some sort of agreement with timing. Last night, after several nearly sleepless nights we figured she was calmer. Perhaps it had something to do with the fact that we took the phone away from her. So we planned to sleep. Then the phone rang at 1AM. This time a neighbor across from the Oldcastle house was calling to the report the garage door and front door were open. We asked him to please lock the house up. We rose early to drive over to see what damage had been done. Nothing. Everything was as it had been. Strange. Then it hit me. I forgot the fundamental rule of property recently abandoned by its occupant. This wish for renovation work full-time must have been the thinking of a brain high on paint fumes. You would be GREAT at professional renovation. Loved the photos and hope you will post more before and after pictures. Hang in there. Aged P’s are a handful. You guys are juggling a lot of full and very hot plates with extraordinary grace.